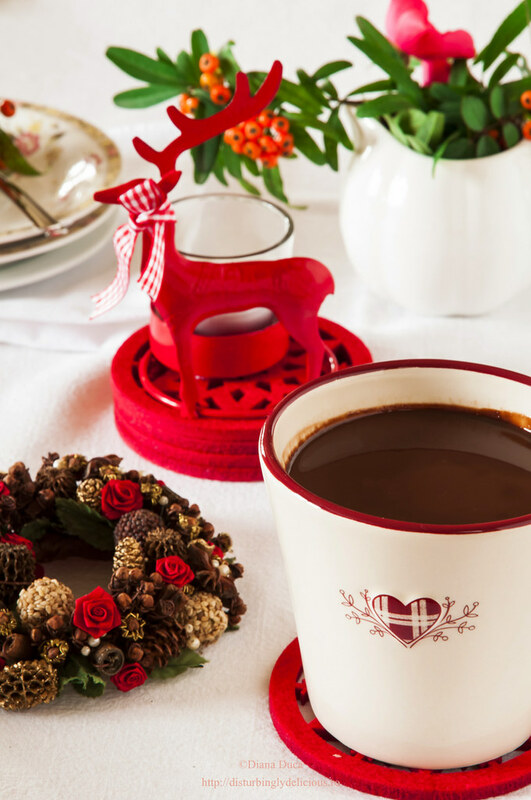 Winter comes with Cristhmas markets, roasted chestnuts, gingerbread, mulled wine with a scent of cinnamon and…with hot chocolate. And we know for sure winter came when during our walks around the city we look in every pastry shop for the flavored hot drink that will warm us up. We also know winter came when we tuck ourselves under the blankets on the sofa with a big cup of the magic drink to watch a movie or to read a book. 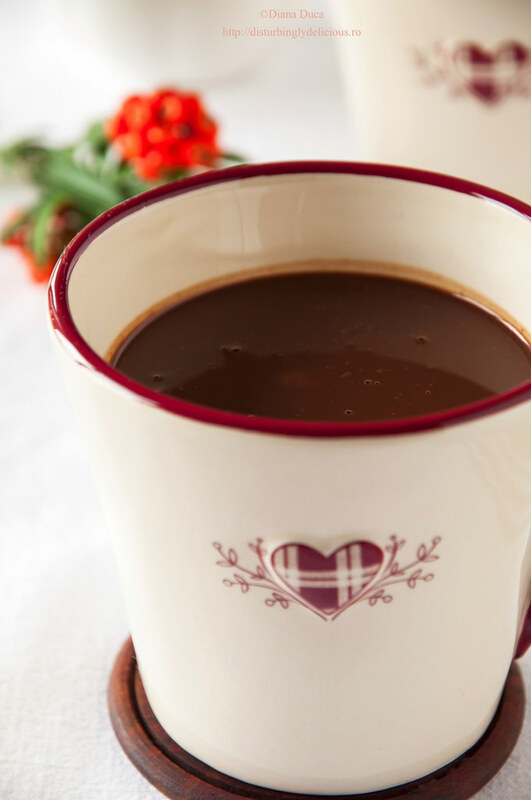 Whatever you choose to do, when you want to treat yourself with a cup of hot chocolate at home, just try it homemade. 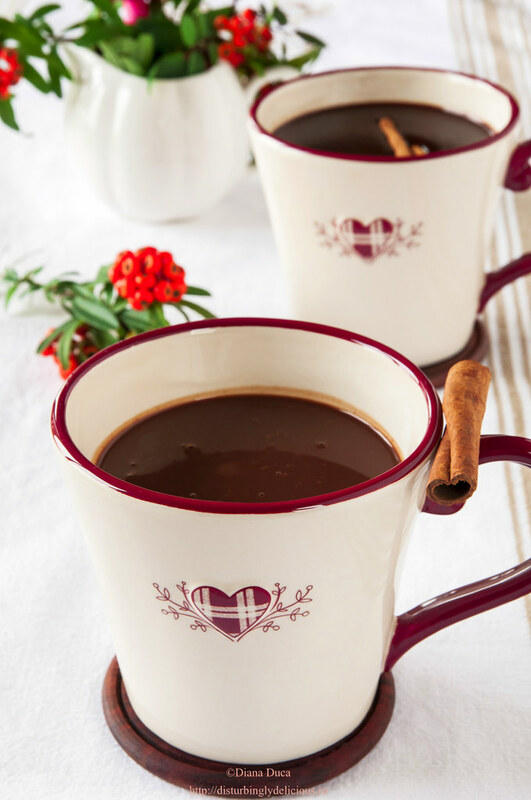 With a bit of patience and a splash of fantasy you’ll get the most delicious hot chocolate ever. This is my idea of hot chocolate this season – flavored with orange and cinnamon. Melt the chocolate with half of the milk in a sauce pan stirring continuously until completely melted. Whisk in the remaining milk. Add the cinnamon. Use a whisk and mix the hot chocolate until it becomes creamy and smooth. Care e ciocolata ta preferată? Adică ce marcă? Alina, îmi plac mai multe dar printre preferate se numără Amedei și Valhorna; pentru ciocolata caldă am folosit Venchi. Ție care îți place? Nu am încercat niciuna dintre cele enumerate de tine. Faza e că tu în Milano ai multe buticuri de unde iti poti procura ciocolata. Eu nu o consum, în general folosesc ciocolată neagră la deserturi. Și cu cât e mai neagră și mai fină cu atât e mai bun desertul! E minunata! Pana la mine a ajuns aroma ei. Cred ca-i delicioasa si as servi o cana,daca tot am renuntat la cafea. Nu-mi pot imagina altfel gustul decit cel pe care-l simt acum in gura pt ca …da, am acea halucinatie gustativa care e absolut normala in unele situatii!